Fans who have been gearing up for football season like so many Americans each year (and you know who you are! ), have undoubtedly hosted and attended a lot of tailgating parties. In fact, tailgating has become quite the rising lifestyle trend in recent years – some even consider it a sporting event of its own that goes way beyond supporting one’s favorite team. For many, tailgating is a tradition that spans multiple generations. Tailgating is such a phenomenon in both the NFL and Collegiate leagues that National Tailgating Day (Sept. 1, 2018) has been designated as the first Saturday in September each year. And it’s competitive – there’s even a National Collegiate Tailgating Championship (NCTC) organization, “Where Fans Meet to Compete” that sponsors an annual contest for the best tailgating crew. Fans from all over the country and even abroad, have been known to drive, fly and travel across many state lines just to make it to their favorite team games. From outfitting your SUV, truck or other vehicle of choice, to preparing those must-have favorite foods, or multi-course menus that would impress any culinary enthusiast, even to the design and set up of their “tailgate scape” – family, friends and fans alike can enjoy this treasured sport with a healthy dose of team spirit. One trend in particular – the RV tailgating experience, continues to grow in popularity and scale. 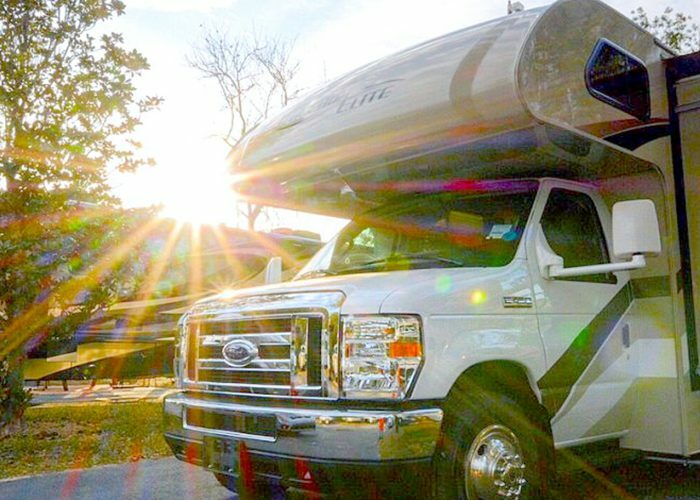 Not just a means of transport anymore, RVs have evolved from road trips and camping trips into unique travel and dwelling adventures – and now the options have grown even more. Ideal for exploring the country and serving as mobile event venues, RVs offer the comfort and convenience of feeling at home, even at locations such as your favorite home game. With the amenities RVs offer today, fans can entertain family and friends with complete comfort at any destination they choose. RV’s provide everything you need with interior and exterior amenities including large screen TV’s, full kitchens and immense storage areas, as well as outdoor awnings, patios, entertainment centers, and kitchens. There’s no need to search for a hotel, food or beverages, restrooms, wifi, etc. – and the best part is, you get to be right in the heart of some of the biggest football social events of the season. No one understands tailgating and how to create an epic tailgating experience better than Lazydays RV, The RV Authority®. With locations in Florida, Colorado, Arizona and Minnesota, the company is the exclusive RV partner of the Tampa Bay Buccaneers, Florida Gators, and Denver Broncos. Lazydays hosts family fun RV tailgating activities at each home stadium, including dedicated RV tailgating lots and displays of the nation’s top RV brands. The vehicles are open for browsing, so fans can explore different models available, and if you’re not in the market to purchase an RV, Lazydays also provides RV rentals. The Lazydays Arizona showroom is located in Tucson, also home to the Arizona Wildcats; while the Lazydays Minnesota showroom is in the Minneapolis area, home to the Minnesota Golden Gophers and Minnesota Vikings. Most current models come equipped with one or more extendable rooms to provide the interior comforts of home, while outside they house retractable awnings, exterior TV and radio systems and loads of storage. Even if you don’t make it out to tailgate during the season, you can still enter to win the Buccaneers, Broncos or Gators “Lazydays RV Ultimate RV Tailgating Experience” sweepstakes for four tickets to the final home game, pre-game use of a Lazydays RV and other prizes. Bucs and Broncos fans can enter at Lazydays’ Tampa, Denver, Longmont and Loveland dealerships, and Gators fans can enter online at Lazydays.com. Lazydays RV features more than 2,700 new and pre-owned RVs, 350 service bays and two on-site campgrounds with over 700 RV campsites. Lazydays also has rental fleets in Florida, Colorado, and Minnesota. In addition, Lazydays RV Accessories & More stores offer thousands of accessories and hard-to-find parts at all of our dealership locations. For most people, Lazydays RV isn’t just the beginning of their journey; it’s very much a part of their ride. Learn more about Lazydays here! Previous Article Stay & Play at Pio Pico RV in Southern California! Next Article 310 (Days) in Yuma!